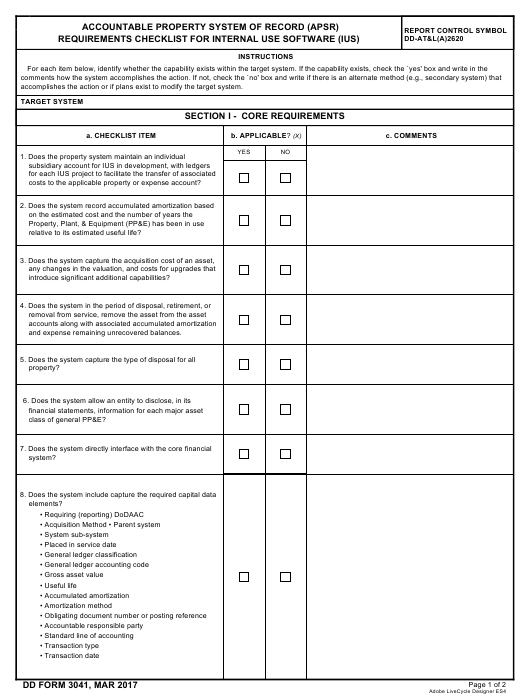 DD Form 3041 - also known as the "Accountable Property System Of Record (apsr) Requirements Checklist For Internal Use Software (ius)" - is a Military form issued and used by the United States Department of Defense. The form - often incorrectly referred to as the DA form 3041 - was last revised on March 1, 2017. Download an up-to-date fillable DD Form 3041 down below in PDF-format or find it on the Department of Defense documentation website. accomplishes the action or if plans exist to modify the target system. costs to the applicable property or expense account? relative to its estimated useful life? and expense remaining unrecovered balances.